A disagreement between the laws of two states with reference to litigation affecting private rights claimed to be subject to their jurisdiction. The Mosaic law recognizes no distinction between a native and a foreigner (Ex. xii. 49; Num. xv. 15, 16). In questions of ritual and religious practises the Talmudic principle enjoins obedience to local custom. One who comes from Palestine, where the second day of the holidays is not observed, to a land where it is observed, must follow the custom of the country wherein he has settled. If, however, his intention is to return to his former abode in a short time, he must follow the more rigorous observance of either place (Pes. 50a; Maimonides, "Yad," Shebitot Yomtob, viii. 20; Shulḥan 'Aruk, Oraḥ Ḥayyim, 468, 3, 4, and 496, 3). In criminal cases the Jewish law has practically abdicated its authority in favor of the law of the land. Forty years before the destruction of the Second Temple, the Sanhedrin in Jerusalem adjourned; and since then the Jewish courts have had no jurisdiction in cases involving capital punishment ('Ab. Zarah 8b; Sanh. 41a, 52b; "Yad," Sanh. xiv. 11, 13). Nor are cases involving pecuniary penalties adjudicated upon by Jewish courts. Only such cases as occur frequently and involve actual loss to one of the parties may now be judged by Jewish courts; but in matters involving no actual loss, as the double payment for theft, or in matters that are not of frequent occurrence, as when one animal injures another, the rabbis of the present day can exercise no authority (B. Ḳ. 84b; Maimonides, l.c. v. 8 et seq. ; Shulḥan 'Aruk, Ḥoshen Mishpaṭ, 1 et seq.). In civil cases the following rules were established by the Rabbis. 1. In suits between two Israelites the law of the place where the contract was made governs, or, if the place is not mentioned in the contract, the law of the place where the case is tried rules (B. M. 83a; Ket. 110b; "Yad," Ishut, xxiii. 12; Ḥoshen Mishpaṭ, 42, 14, 15; Eben ha-'Ezer, 117, 19, Isserles' gloss). 2. In suits between non-Jews the law of the land or the Jewish law—to whichever the parties submit themselves—governs ("Yad," Melakim, x. 12). 3. In matters between a Jew and a non-Jew the suit is decided according to the law of the land or according to the Jewish law, that system being chosen which favors the Jew. In each case, however, the non-Jew should be informed by what system he was judged (B. Ḳ. 113a; Maimonides, ib.). If the non-Jew observes the general laws of morality and religion ("get toshab," Lev. xxv. 35, and elsewhere), the law of the land must govern (Maimonides, ib.). A non-Jew who sells a promissory note to a Jew can not afterward absolve the debtor, although the Jewish law permits it; for the law of the land governs. If a Jew sells a promissory note to a land-Jew, it is as if he sold it to a Jew; and the Jewish law holds sway (Ḥoshen Mishpaṭ, lxvi. 25). See Assignment. 4. Documents of purchase and sale, or promissory notes, prepared in non-Jewish courts and signed by non-Jews, are valid. Documents of gift or of the admission of a debt, where actual delivery of money did not accompany the act, are not valid (Giṭ. 10b; "Yad," Malweh, xxvii. 1; Ḥoshen Mishpaṭ, 68, 1). Where there is a decree of the government ordering the record of all negotiations, all documents prepared in non-Jewish courts are valid (Ḥoshen Mishpaṭ, l.c., Isserles' gloss). 5. It is forbidden by Jewish law to litigate a suit between two Israelites before a non-Jewish court, even when both parties desire it (Giṭ. 88b; "Yad," Sanh. xxvi. 7; Ḥoshen Mishpaṭ, xxvi. 1). If one of the parties refuses to appear belore a Jewish court, the other must first summon him through the Jewish court; and if he does not heed the summons, permission will be granted to him to sue the defendant before a non-Jewish. court (Maimonides ib. ; Ḥoshen Mishpaṭ, ib.). 6. Referring to the Persian law, the amora Samuel said: ("the law of the land is the law," Giṭ. 10b; B. Ḳ. 113a). This dictum is particularly applied to cases between Jews and non-Jews. Although according to the Jewish law three years' uninterrupted possession of real estate ("Ḥazaḳah") establishes one's right to land, in Persia, where forty years of uninterrupted possession was necessary, the same law held good also for the Jews of that land (B. B. 55a; see Rashbam's commentary). This principle has been accepted as valid by all well-regulated governments in cases of taxes or of other regulations made for the welfare of the community ("Yad," Gezelah we-Abedah, v. 11-18; Ḥoshen Mishpaṭ, 369, 6-11). ) Where, however, the case does not affect the community, and the government derives no special benefit from it—where the law of the land is that the husband does not inherit from his wife—the Jewish law predominates; and the wife's relatives have no claim on her property, if she dies during the life of her husband (Ḥoshen Mishpaṭ, l.c., Isserles' gloss; see "Pitḥc Teshubah" ad loc. § 3, and to 248, § 2; "Ḥatham Sofer, Ḥoshen Mishpaṭ," 172). Of course, this could be the case only in those countries where Jewish autonomy is recognized in cases of inheritance. It is not the case in England, America, or western European states, for example. The tendency of the Talmud and of the later codes is generally toward submission to the law of the land in all civil cases, when such law is humane and the Jews are allowed an equal hearing in the courts with non-Jews. The fact that now the Jewish court has almost entirely lost its power, and the Rabbis, even those of the most Orthodox wing, raise no objection against those who resort to non-Jewish courts, upon whom Maimonides and his followers have pronounced the ban of excommunication. (see Midr. Tan., Mishpaṭim, 10; "Yad," Sanh. xxvi. 7), proves that this is the tendency in the progress of the Jewish law. In civil cases, therefore, the lawof the land, even when in conflict with the Jewish law, is now tacitly recognized by all as binding. The question was frequently raised whether marriage and divorce are religious acts, and must, therefore, be in accordance with Jewish law and custom; or whether they may also be included under civil laws generally and be governed by the laws of the state; or whether they are partly religious and partly civil in their character. This question was discussed in periodicals and in books and at the different conferences of rabbis held during the nineteenth century; but no uniform law has as yet been established in regard to it. The Assembly of Notables, convened by Napoleon I. in 1806 in Paris, among other matters brought before it, had to answer the question as to the relation between the civil and the Jewish law in matters pertaining to marriage and divorce. 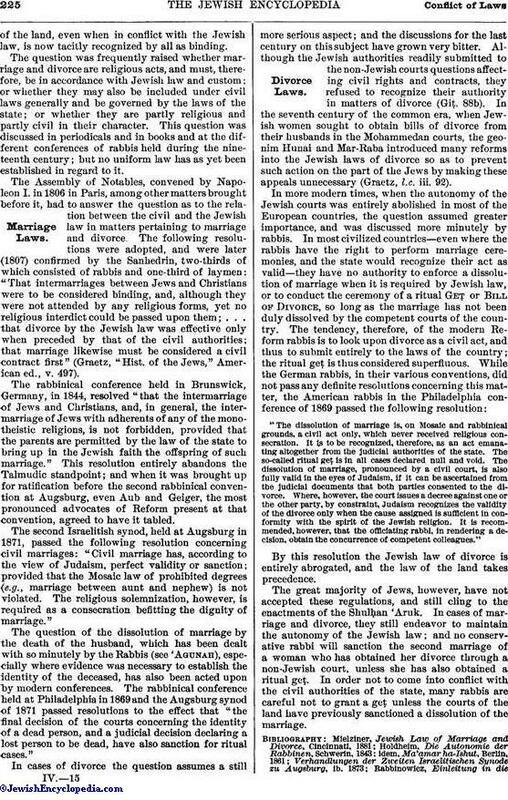 The following resolutions were adopted, and were later (1807) confirmed by the Sanhedrin, two-thirds of which consisted of rabbis and one-third of laymen: "'That intermarriages between Jews and Christians were to be considered binding, and, although they were not attended by any religious forms, yet no religious interdict could be passed upon them; . . . that divorce by the Jewish law was effective only when preceded by that of the civil authorities; that marriage likewise must be considered a civil contract first" (Graetz, " Hist. of the Jews," American ed., v. 497). 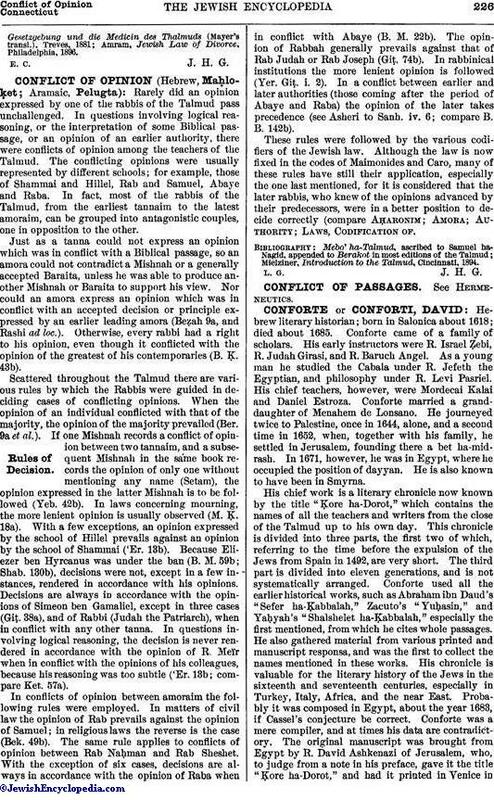 The rabbinical conference held in Brunswick, Germany, in 1844, resolved "that the intermarriage of Jews and Christians, and, in general, the inter-marriage of Jews with adherents of any of the monotheistic religions, is not forbidden, provided that the parents are permitted by the law of the state to bring up in the Jewish faith the offspring of such marriage." This resolution entirely abandons the Talmudic standpoint; and when it was brought up for ratification before the second rabbinical convention at Augsburg, even Aub and Geiger, the most pronounced advocates of Reform present at that convention, agreed to have it tabled. The second Israclitish synod, held at Augsburg in 1871, passed the following resolution concerning civil marriages: "Civil marriage has, according to the view of Judaism, perfect validity or sanction; provided that the Mosaic law of prohibited degrees (e.g., marriage between aunt and nephew) is not violated. The religious solemnization, however, is required as a consecration befitting the dignity of marriage." The question of the dissolution of marriage by the death of the husband, which has been dealt with so minutely by the Rabbis (see 'Agunah), especially where evidence was necessary to establish the identity of the deceased, has also been acted upon by modern conferences. The rabbinical conference held at Philadelphia in 1869 and the Augsburg synod of 1871 passed resolutions to the effect that "the final decision of the courts concerning the identity of a dead person, and a judicial decision declaring a lost person to be dead, have also sanction for ritual cases." In cases of divorce the question assumes a still more serious aspect; and the discussions for the last century on this subject have grown very bitter. Although the Jewish authorities readily submitted to the non-Jewish courts questions affecting civil rights and contracts, they refused to recognize their authority ill matters of divorce (Git. 88b). In the seventh century of the common era, when Jewish women sought to obtain bills of divorce from their husbands in the Mohammedan courts, the geonim Hunai and Mar-Raba introduced many reforms into the Jewish laws of divorce so as to prevent such action on the part of the Jews by making these appeals unnecessary (Graetz, l.c. iii. 92). "The dissolution of marriage is, on Mosaic and rabbinical grounds, a civil act only, which never received religious consecration. It Is to be recognized, therefore, as an act emanating altogether from the judicial authorities of the state. The so-called ritual geṭ is in all cases declared null and void. The dissolution of marriage, pronounced by a civil court, is also fully valid in the eyes of Judaism, if it can be ascertained from the judicial documents that both parties consented to the divorce. Where, however, the court issues a decree against one or the other party, by constraint, Judaism recognizes the validity of the divorce only when the cause assigned is sufficient in conformity with the spirit of the Jewish religion. It is recommended, however, that the officiating rabbi, in rendering a decision, obtain the concurrence of competent colleagues." By this resolution the Jewish law of divorce is entirely abrogated, and the law of the land takes precedence. The great majority of Jews, however, have not accepted these regulations, and still cling to the enactments of the Shulḥan 'Aruk. In cases of marriage and divorce, they still endeavor to maintain the autonomy of the Jewish law; and no conservative rabbi will sanction the second marriage of a woman who has obtained her divorce through a non-Jewish court, unless she has also obtained a ritual geṭ. In order not to come into conflict with the civil authorities of the state, many rabbis are careful not to grant a geṭ unless the courts of the land have previously sanctioned a dissolution of the marriage. 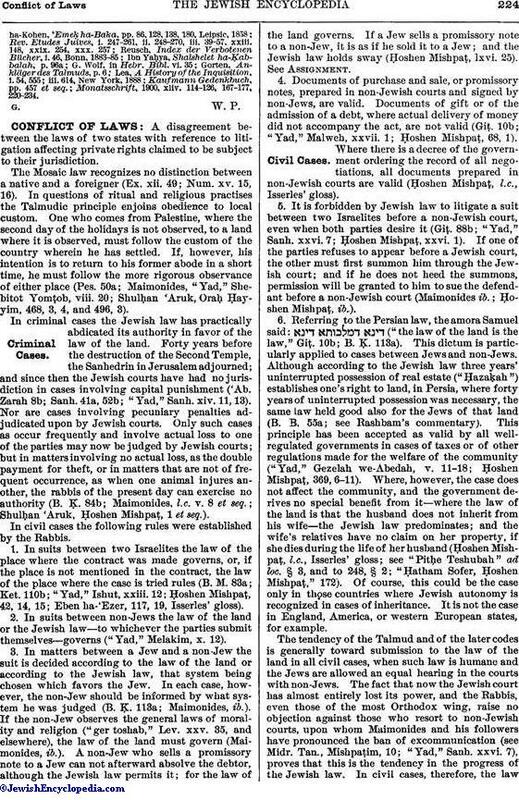 Amram, Jewish Law of Divorce, Philadelphia, 1896.